Astronauts Stephen Bowen and Alvin Drew successfully moved a 780-pound ammonia pump module from a temporary mounting point, where it was left after emergency repair work in August, to an insulated enclosure where it will remain until it's loaded aboard the shuttle Atlantis this summer for return to Earth. Bowen, anchored to the end of the space station's robot arm, carried the boxy pump module from the forward side of the station's solar power truss to a cargo storage pallet on the Quest airlock. Assisted by Drew, Bowen slid the pump into its enclosure and the astronauts locked it in place. A vent line was attached that will be used during a spacewalk Wednesday to release any residual ammonia trapped inside the pump. The pump move went smoothly after an unexpected robot arm work station shut down that forced station commander Scott Kelly and Discovery astronaut Michael Barratt to switch to a spare workstation inside the Destiny laboratory module. The original work station, mounted in the multi-window cupola, later was re-activated. 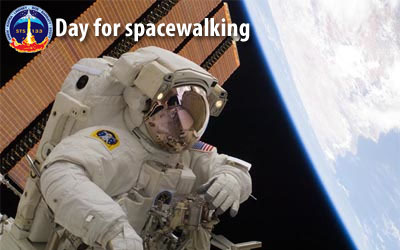 With the pump module in place, the spacewalkers have accomplished the two primary objectives of the spacewalk. The astronauts now will turn their attention to a variety of maintenance tasks, including installation of a tool stanchion, insulation repair work on the upper Z1 truss segment and installation of a wedge to tilt an external camera away from a newly installed cargo pallet. If time is available, rail extensions will be added to the starboard end of a track used by the robot arm's mobile transporter.